Sea and Wood: 80's Fantasy Film Swap - what I sent! 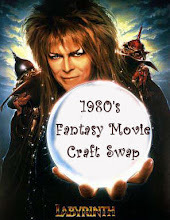 80's Fantasy Film Swap - what I sent! So would you like to see what was in the parcel? I know it's been safely received now so I can do the big reveal! "A COMMANDMENT FROM HIS IMPERIAL MAJESTY"
Cross stitch on 28ct linen, generated with the caption maker at crosstitch.com - a very handy little tool! The phrase is from the film Flash Gordon, which you'll see scrolling across the sky during the scene of Ming and Dale Arden's wedding. I know Amiee has young kids and it reminded me of the "enjoy yourself or else!" phrase parents sometimes come out with! Quite possibly my all-time favourite film ever. Inspired by Hoggle, the double-crossing dwarf from Labyrinth - Sarah presents him with a plastic bracelet if he'll guide her to the Goblin Castle. 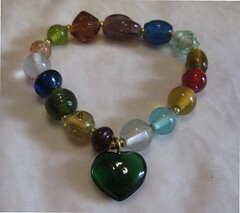 These are glass beads, which are a little more grown-up! I got these beads at Heidelberg Weinachtsmarkt (Christmas market) about five years ago on an enormous strand at least 2m long. Not many left now - good excuse to go back! 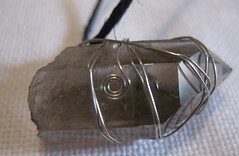 "Keep it safe - Jen & Kira"
Wire-wrapped smokey quartz on thonging - I was looking for a piece of amethyst for this but didn't find any as nicely shaped as the smokey quartz. A piece of The Dark Crystal. Amiee sent me a wonderful print from this film. "Best wishes from Santa Carla - Michael & Sam Emerson"
A hand-bound journal created from the cover of a copy of The Lost Boys on video. 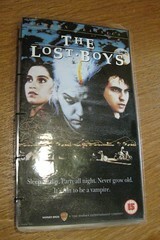 This was perhaps the hardest part of the challenge - I knew Lost Boys was Amiee's favourite film, but what to make? For this I mounted the video cover on black card, cut the front and back sides to size, then laminated it. The endpapers are purple vellum and the pages heavy cream paper, and it's bound together in the Coptic style. 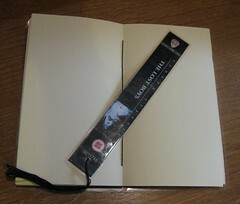 I also turned the spine into a bookmark! "We got him! Love Flash"
Emperor Ming himself, again from Flash Gordon. He's less than 10cm tall, crocheted to roughly the standard Creepy Cute pattern and finished with over 300 gold bugle beads on red satin and felt. 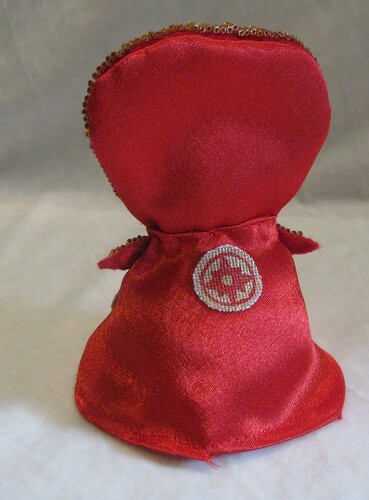 The emblems are gold and red fabric paint on linen. This particular costume is Ming's wedding outfit. I wanted to sent a copy of The Faeries Oracle because it's such a good way to look at Froud's work (he is responsible for the characters in Labyrinth and Dark Crystal) however you use it. I find it very inspiring just to sit and look at the cards. Also included are some fat quarters which made me think of deep forests and starry nights, some buttons, some crystals and some sweeties and chocolate. I've thoroughly enjoyed being able to use so many different crafts for one project, it's been fascinating. Huge thanks to Meridian Ariel for organising the swap, and to Fraggie Rocks for being such a great and inspiring partner! Sorry for the smallness of some of these pictures - I think if you go to my Flickr photostream you should be able to get a better view. I'm really struggling with my camera/Blogger doing funny things with the rotation at the moment. Blooming absolutely great! Love that little ami Ming! Brilliant. that is just fantastic... I want to cuddle Ming!! 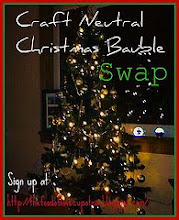 so glad you had oodles of fun with the swap! h my goodness what a huge ammount of stuff - i fear my parcel to my partner was rather lacking. i love the handmade book that is fantastic recycling. That is all amazingly wonderful . I love Ming. Your swap partner must be so pleased. The book isn't really that eco-friendly, I have to say :( I did have everything in stash - the paper is from a ream we didn't use up on wedding invites, for example - but only the actual cover is re/upcycled. 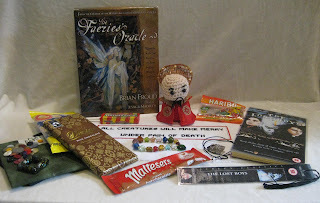 What a FANTASTIC parcel, the thought that went into it is wonderful, fraggie must be over the moon, and ming - spectacular! What a fantastic parcel of goodies! 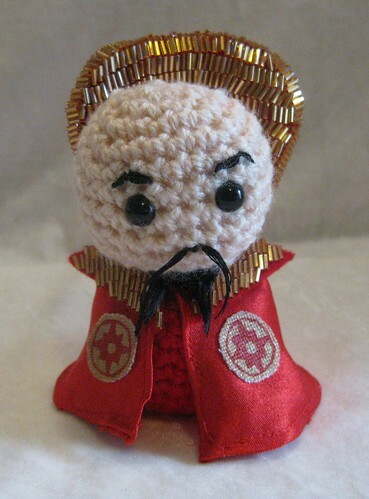 Ming is utterly marvellous - I also adore the cross stitch too, gave me quite a chuckle.